Despite a less than ambitious history when it comes to developing electric and hybrid cars, VW has announced that it’s aiming to become the world’s largest maker of electric cars by 2018. The company had previously announced its intention to become the world’s largest automaker by 2018. That still applies, but is adding a new focus on electric cars as well. It looks like VW has finally realised the days of fossil-fuelled cars are numbered, however long that takes. VW has previously focused on increasingly fuel efficient diesel cars. Fossil fuel efficiency can only go so far before the move to electric is made, however. To kick things off, VW is aiming to have 14 hybrid models by next year. These will include: VW Jetta Hybrid, Touareg Hybrid, Audi Q5 Hybrid, Porsche Cayenne S Hybrid and Panamera S Hybrid, and the upcoming plug-in Panamera S E-Hybrid. 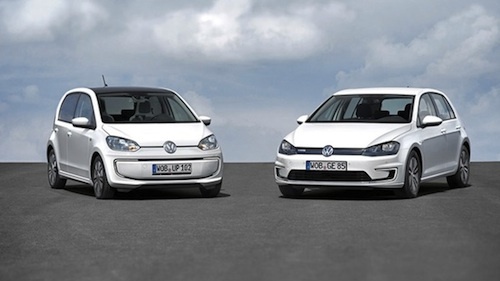 The big news is that the very popular VW Golf line is going to be made in an electric version: the VW e-Golf. Originally planned for 2014, it is now expected to be released in 2015. The e-Golf will have an 85 KW/115 PS electric motor with up to 12,000-RPM, and 270 Nm of torque. The car will be powered by a 24.2 KWh lithium-ion battery pack, made with 264 individual cells. 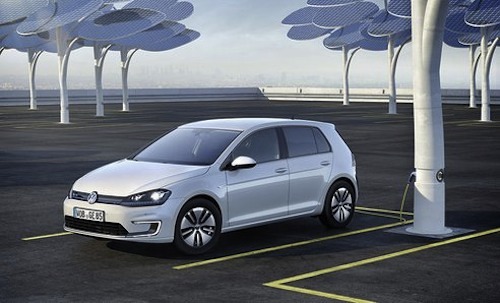 The e-Golf will have 130-190 km or 81-118 miles of range per change, depending on conditions. There are no details on pricing available just yet. Presumably it will be priced competitively with the Nissan LEAF, at least in some markets. 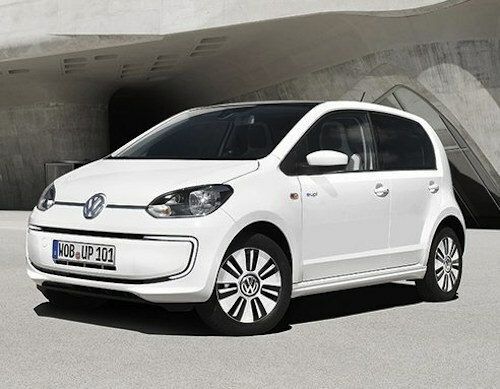 The smaller VW e-up! will have a 60KW/82PS electric motor with 210 Nm of torque. The lithium-ion battery pack will also be smaller at 18.7 kWh, but will give a driving range of between 120-160km or 75-99 miles, depending on conditions. How do these models look to you? Do you think VW can emerge as the biggest maker of electric cars by 2018, after a very slow start? Tagged as: auto industry, electric cars, EVs, VW, VW e-golf, VW e-up! Previous post: 1% Of US Power Plants Emit 33% Of Energy Industry Carbon. Easy Fix?